I started playing beach volleyball in 2012 after playing indoor volleyball for five years. It was during the French Championships in 2011. I was playing with Greg Brachard and we finished in second place, just behind the ‘Ces Brothers’. I was playing in the French first division at the time with Arago de Sète and playing for the national indoor team. I was a libero and did not get many chances to play. When I experienced the pleasure of playing on the sand and touching the ball so often, I began thinking of turning to beach volleyball! 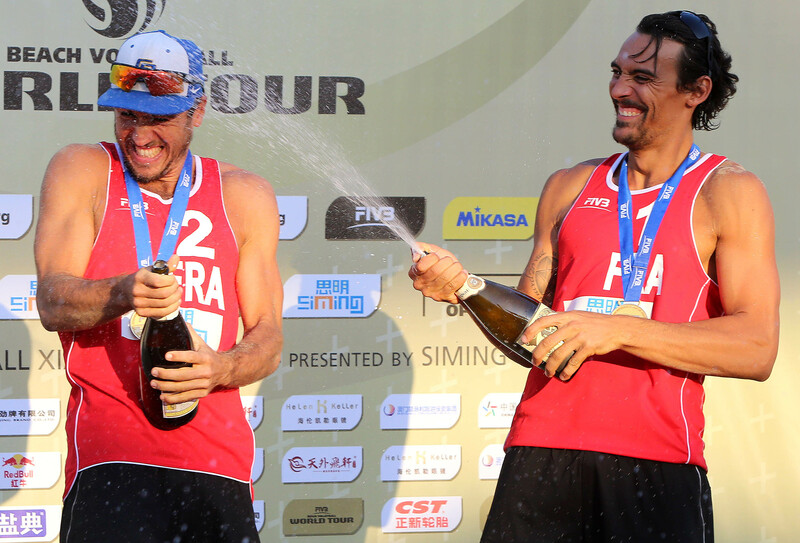 How important is it for beach volleyball in France to qualify for the World Championships? Qualifying for the World Championships is a priority for us in order to be able to aim for the Olympics in Rio in 2016. If you don't play the World Championships this year, you won't qualify for next year's Olympics. Olympic qualification would boost the image of beach volleyball in France. We have had no French teams competing at the Olympics since 2004. We are really motivated to fulfil this dream! We will travel to the Netherlands with the ambition to win the title of course! That is the objective of each team. But we would be satisfied by finishing fifth. We will go there as big challengers, without any pressure. We know we can beat any team, but to become champions it is important to maintain a big rhythm as long as possible. Which of your opponents do you admire most and why? I do not admire opponents, even if I respect them. Players like Emanuel [Rego] inspire me a lot. But also players like [Sean] Rosenthal, [Daniele] Lupo, [Grzegorz] Fijalek and many others. There is always a skill you want to take from each of them. During off-season, I love going to the mountains. After being in the sun the whole year, it is so relaxing to enjoy cool mountain air. I like ski touring and free-ride downhill runs. I spend a lot of time in the mountains learning about different mountain activities. My favorite destination would be Chamonix, the capital of mountaineering. The most special location I have ever played at is Zurich railway station, last season. The concept of playing in a big station was both fun and original. We’ll be doing a lot of physical and technical conditioning at home in Montpellier. We’re also planning to make a trip to Egypt at the beginning of March. There we’ll be training with [Aleksandrs] Samoilovs and [Janis] Smedins - they are currently the highest ranked team in the world. In April, we’ll have a final training session in Tenerife before the Fuzhou Open in China, our first event of the season.